thank you so much for updating my stuff!! I have had wrist issues for the past 9 months or so so I haven't been able to work on them myself. you emulated the style so well! With Grape.Hud default the map voting screen is missing textures / colors on the red half of the end match scoreboard. If anyone knows what file corresponds to the end match scoreboard and wouldn't mind sharing the information I will be incredibly thankful. How do you change the font on Community Hud 2018? I want to use the PVHud one. medicalmalpracticeHow do you change the font on Community Hud 2018? I want to use the PVHud one. Pretty sure there is a clientscheme selection for the fonts you want to use. TheDoorMatWith Grape.Hud default the map voting screen is missing textures / colors on the red half of the end match scoreboard. If anyone knows what file corresponds to the end match scoreboard and wouldn't mind sharing the information I will be incredibly thankful. Enable minmode for the pvhud style and disable it fro the flame hud style, you can also change the font to surface by renaming the clientscheme like maniacal said. flatlinethank you so much for updating my stuff!! I have had wrist issues for the past 9 months or so so I haven't been able to work on them myself. you emulated the style so well! Hey no problem! and feel free to merge the edits of course its your hud! [quote=flatline]thank you so much for updating my stuff!! I have had wrist issues for the past 9 months or so so I haven't been able to work on them myself. you emulated the style so well! can someone update rayshud or is it already updated? Torquecan someone update rayshud or is it already updated? Hypnotize TheDoorMatWith Grape.Hud default the map voting screen is missing textures / colors on the red half of the end match scoreboard. If anyone knows what file corresponds to the end match scoreboard and wouldn't mind sharing the information I will be incredibly thankful. I have a question. Why is Oxide Hud's 4:3 outdated? SRankI have a question. Why is Oxide Hud's 4:3 outdated? I can tell some thing's wrong with it. When you lose a match there would be no losing panel. [quote=medicalmalpractice]Screenshot? [/quote] I can tell some thing's wrong with it. When you lose a match there would be no losing panel. https://imgur.com/TjuRNje - Example of what I'm talking about. wich of the huds in the github have a "console" button in the main menu UI ? Hey, can you please update Blade HUD? I don't guarantee it, but I can try to update it when I can. sagewich of the huds in the github have a "console" button in the main menu UI ? Most of them, i think I got like 10-15 huds max that are missing one. In some of them is the hud name that is clickable and works as a console button, some have a dedicated button and others use the commentary button as a console button. If a hud doesn't have any of those buttons then it probably doesn't have a console button at all. medicalmalpracticeHey, can you please update Blade HUD? Oxide hud is the same hud with very little changes! The dominations label on bx-m0rehud's scoreboard seems a bit bugged. AdjeThe dominations label on bx-m0rehud's scoreboard seems a bit bugged. The font is already in the hud you just need to choose which one you want to use. Go to resource/fonts and install the second AvenirLTStd-Black in this case. [quote=Adje]The dominations label on bx-m0rehud's scoreboard seems a bit bugged. Hypnotize AdjeThe dominations label on bx-m0rehud's scoreboard seems a bit bugged. [quote=Hypnotize][quote=Adje]The dominations label on bx-m0rehud's scoreboard seems a bit bugged. 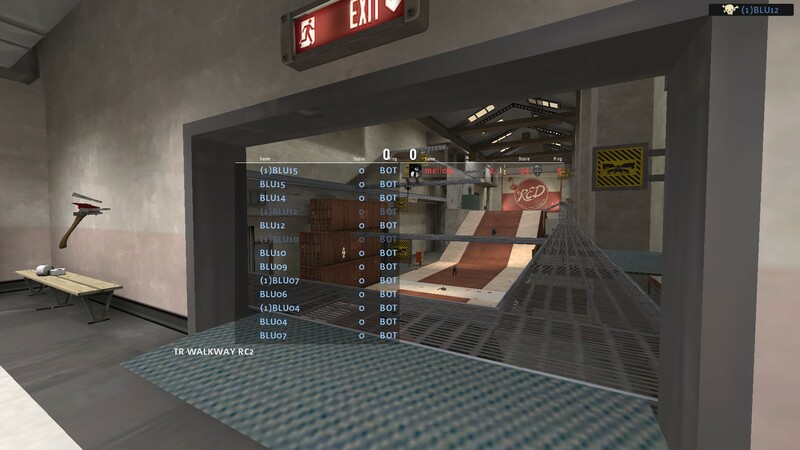 anyone know what this version of m0re hud is? any chance you could update it please brudda?